On Valentine’s Day, I did the next most romantic thing besides actually being on a date – I talked to someone who has been on countless dates and will have a perpetual supply of dates for the rest of his life. 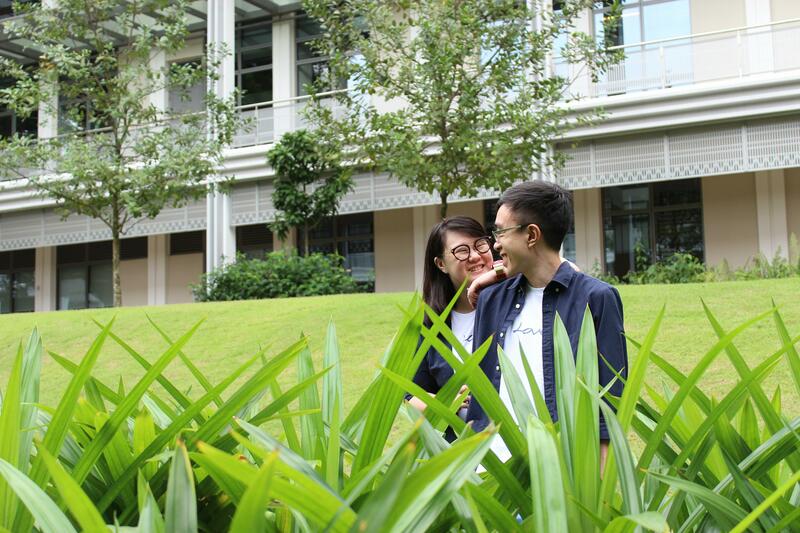 I interviewed Timothy Goh ’18, one of the few engaged students in Yale-NUS College, and talked to him about his engagement to his fiancée, Jael. We sat on a bench below the library. It was a still, quiet space against the backdrop of a chatter-filled Café Agora. This almost reflected the nature of the interview itself – Timothy had a sort of a quiet energy and wisdom while I was excited and giggly talking about romance. However, this seemingly glaring ‘contradiction’ actually made perfect sense to me after I listened to him tell me his story – a series of missed connections, misinterpreted words, and finally, meeting the right person at the right time. 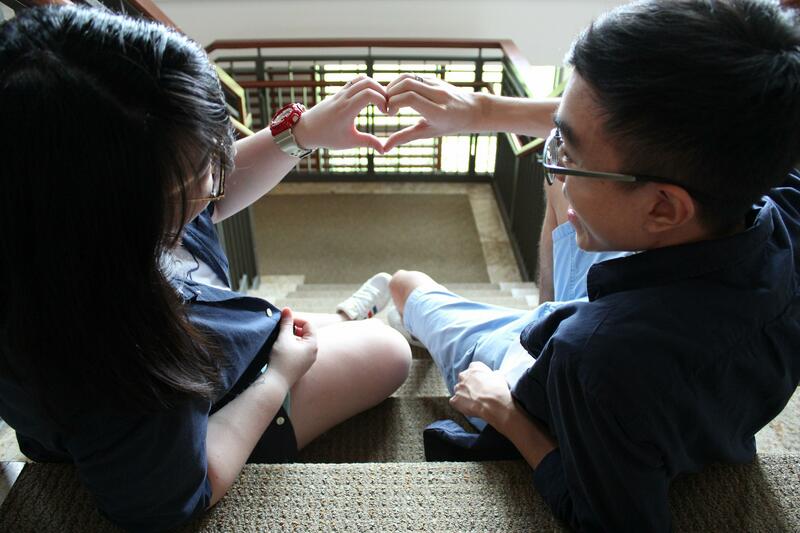 In Timothy and Jael’s relationship, time and change did not seem to be experienced linearly. Ed: Responses have been lightly edited for clarity and brevity. How did all this happen? How did you end up getting engaged? We have been engaged for about 15 months, a couple for slightly over 4 years, and friends for 7 years before that. I met her when I was in my second or third year of secondary school, and she was nearing the end of her fourth year and going to Junior College. We were both in the same youth group in church. At that time, she was actually dating a friend of mine, and we met on a double date. I remember that it ended up being this way because her parents did not really want her going out on a date with my friend, so he asked me to come along with a random friend of hers. It was super awkward because that girl and I didn’t know each other, and we just stood there staring at each other, third (fourth?) wheeling another couple. Boy: Oh hey, I need to talk to you about something. But sadly, I got friendzoned. I didn’t give up though, and I got friendzoned again after I tried again another time. I then found out she was moving to Australia for further studies, and wrote her a letter asking her to reconsider. She ignored it though. I was then in my second year of Junior College. Oh, you know I’ve been looking through all the old letters we used to write as friends. I am looking through the one where you asked me to be your girlfriend. I know at the time I said no but I think things were different then. If you ask me now, my answer may not be the same. Okay, great, can we meet up to discuss this? Eventually we met up and talked, and I asked her to be my girlfriend, which she agreed to. Six months later, while recounting the story to friends in Yale-NUS, she clarified that she actually had no intention of asking me out when she had initially texted me. She said that she was just stating the obvious—that we both had changed and that I had grown and matured after all these years spent apart. What made you so attracted to her in the first place, and for so long? Certainly different things over time. Eleven years is a long time, and as you get to know a person better, you are able to see so many aspects of them. At first what really attracted me was her character. She is very sweet, caring and kind. Even from the get-go, we could really talk to each other about everything. Her big-heartedness has never changed. She’s the kind of person who owns a hundred packets of tissues under her table because she buys them from every tissue paper-selling auntie she encounters. I also think that during our time together, even through all the ups and downs, she still loves me unconditionally. She really is committed to helping us work through everything together. This is especially important to me, as I’ve been in relationships before where the other person just seems to be looking out for his or her own happiness. How would you describe your relationship? How do you think you complement her? We’re both very different people but I think we’ve discovered that our differences do complement each other. I’m a bit more disciplined than her. When I start something I really stick to it, whereas for her she has great motivations to start a lot of things but has a difficult time sticking to it. In a way, she starts the spark and I keep the fire going. How is being engaged different from being in a committed, long-term relationship? When we started dating, it was more focused on the present. Engagement, on the contrary, has long-term implications and we now feel even more invested to talk about important things and to smooth out our differences. The concept of time also just seems different because you know that you have committed to spending the rest of your life together. On one hand, it’s scary and intimidating. On the other hand, small upsets don’t matter so much in light of forever… I’m sorry, I know I sound incredibly cheesy. In terms of dates, when we first started going out, we always tried to make our dates new and exciting. Now we just enjoy being with each other. It doesn’t really matter what we do, as long as we are doing it together. How do you think being engaged has changed you as a person? Engagement really forces you to try to be a better person. I have become so much more patient and better at listening. Not only has this helped make my relationship with my fiancée even better, being engaged has allowed me to gain some useful perspectives which helps me to better take care of my friends as well.